TADECO Home is a social enterprise that provides livelihood for some of Mindanao’s agricultural communities. Apart from that goal, TADECO aims to preserve the region’s handweaving traditions by supporting the T’boli weavers - makers of the famed T’nalak fabric. Abaca and banana fibers are the company’s base materials used in the production of TADECO’s original products - handmade paper and textiles. Later on, TADECO started its expansion, using the core materials to manufacture small furniture, lamps, wall covers, home accessories and decor. Seen at Manila FAME October 2018, mesh lamps mde from abaca twine and metal. At Manila FAME 2018, TADECO introduced its latest collections of handmade paper that feature fresh colors and patterns, alongside cushion covers that reveal the intricate textures of the company’s new weaving designs. TADECO’s dramatic installation, a mangrove crafted from banana fiber and metal, also announced the company’s entry in the realm of sculptural decor. The stylized mangrove, which was meant to enhance TADECO’s exhibition, drew admiring stares and a few orders. The scale transformed the mood of the booth, while the exotic mix of natural fibers and metallics added glamour to the rustic setting. 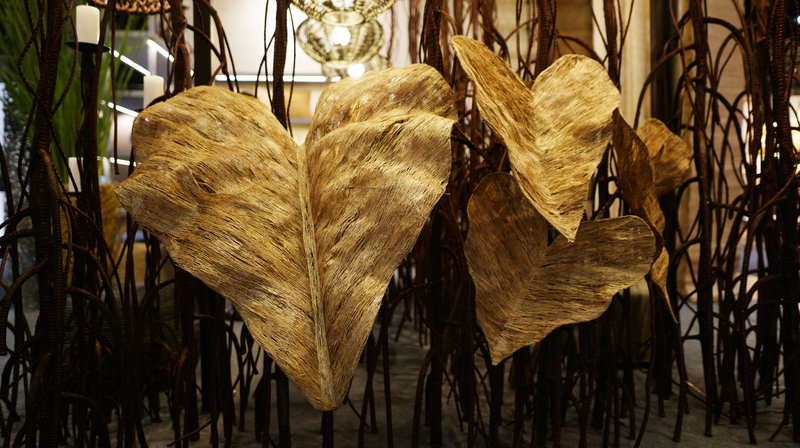 Giant leaves fashioned from dried natural fibers elevated the drama in the booth which was recognized with a Katha Award. Drop lights made from natural fiber and metal wires. Though it has established its name for its T’nalak fabrics and handmade paper, TADECO continuously explores various ways of using abaca and banana fibers. New designs are constantly released by its own pool of designers, alongside the collaborative projects with other creatives. This approach allowed TADECO Home to evolve and expand as a brand. More importantly, TADECO’s efforts contributed to the growing acceptance of - and appreciation for - local fibers and crafts. Giant leaves adorn TADECO Home’s mangrove installation at Manila FAME October 2018.